This is the final installment of a four-part introduction. If you missed the previous posts on the overview, the guest’s perspective, and the manager’s perspective, click the links in this sentence. People ask me on occasion if I aspire to open my own restaurant one day. It always reminds me of the old Mitch Hedburg joke. In reality, owning a restaurant does not appeal to me. I would be the most neurotic and micro managing owner ever. It takes a special breed of person to be willing to take the risk to open a restaurant. The likelihood of failure is tremendous even for a great concept. For those owners that are successful, another challenge awaits. As they step out of a day-to-day operations role and begin to expand, they often lose the connection to the individual staff members. As this continues the restaurant become more focused on profitability rather than simply surviving. Owners begin to focus on managing multiple restaurants from a centralized office and employ managers to actually run the individual stores. As the expansion continues it becomes more and more difficult for the individual employees to relate to the motivations of the owners, as they become corporations. Costs (red): This is all the money that goes into running the restaurant. In the big picture it includes rent, equipment, payroll, marketing, and many other items. On the store level it is food costs, labor, breakage, repairs, and all other controllable expenses. This is the only category that owners have direct control over. Sales (yellow): This is pretty self-explanatory. The amount of food and beverages sold in the restaurants. This offsets the costs in red. 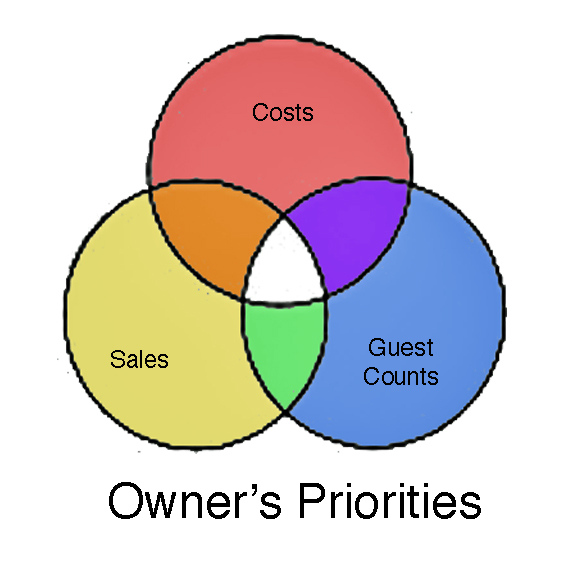 Guest Counts: (blue): This is becoming an increasingly important number in the owner’s mind. Guest counts are often a more accurate representation of a restaurant’s health than sales. Guest counts are distinctly different from sales. Raising prices may increase sales while decreasing guest counts. Lowering prices or issuing coupons may increase guest counts, but lower still lower overall sales. The owner can implement a number of different strategies to affect the areas in pairs. Costs and Sales (orange): This is done by raising prices and increasing profit margins. It will lower overall guest counts as some people search for a better value elsewhere. Executed successfully it still, in the short term, increases profits. Costs and Guest Counts (purple): This entails lowering prices by serving a less expensive product. People will come in to try the discounted food, but often times leave unimpressed. While guest counts increase, they do not do so sufficiently to increase overall sales. Many restaurants attempt this strategy in tough economic conditions, but do so at the risk of losing the image they worked for years to build. Sales and Guest Counts (green): This is the coupons, gift certificates, and promotions. Selling more of the same product by lowering the price, but not the quality. This maintains the reputation of the restaurant, but cuts it’s profit margin on each plate significantly. It may also lead to a future decline in guest counts when the promotion ends and the guests are expected to pay full price. There are strategies that successfully achieve all three. A common approach in the current economic climate is to promote for sales and guest counts (green) while offsetting the food costs by controlling other expenses (labor, supplies, portions, etc). I have seen a number of promotions successfully executed, and even more fail miserably. Future posts will use this framework to describe why some fail and how to get into the white zone in the middle. This week’s series is not necessarily the focus of the blog. I want to deal more with the tips, tricks, and techniques that will help servers make more money. In doing so, we must understand the other perspectives that influence our jobs. Everything I talk about in this blog is about you as a server being in the white zone of all three groups. In each post I mentioned that each group finds difficulty satisfying all three priorities. As servers, we are the key to bringing it all together. We are the ones charged with balancing the three priorities of each group in a way that they cannot. This is why a well-trained and educated server is vital to all three groups. There you have it. The logic behind the circles. In future posts I will refer heavily back to this week’s posts as the framework for understanding where a server’s priorities should be to make the most money. If you missed any of them, you can start at the beginning with Monday’s post. Tomorrow I wrap up my salmon series with the environmental impacts of wild and farm-raised salmon. Hope to see you back.